By Andrea Noelle Franklin D.O. The patient is a 19-year-old male who presented to his pediatrician for evaluation of an insect bite received during a Costa Rican cruise approximately 3 weeks prior. He denied any trauma during the trip, but did notice a small reddened area in his left mid calf several hours following a zip-line tour while on shore. On physical examination, there was a small area of erythema with a small open area centrally which was spontaneously draining serous fluid. A wound culture was performed at his initial office visit, and the patient was placed on a 10-day course of cefdinir. Repeat examination after the full course of antibiotics demonstrated no change to the appearance of the lesion. A repeat culture was performed, and the patient was referred to the Infectious Disease Department at our hospital. Three days following his second visit and before his appointment with the Infectious Disease specialist, the patient experienced severe pain at the site, prompting a visit to a local Emergency Department. A third wound culture was performed, and the patient was again placed on cefdinir. Two days later, the patient presented to a different Emergency Department again with the complaint of severe pain, where plain radiographs demonstrated a small, linear foreign body per the patient’s mother. The patient was placed on a third course of antibiotics, this time DS TMP/SMX, with no change in his symptoms. The Infectious Disease specialist referred the patient for an ultrasound (Fig.) to evaluate for abscess or retained soft tissue foreign body. Of note, the patient had no other symptoms other than pain at the site. The most common cause of a superficial inflammatory lesion with drainage to the skin is an infection, described as abscess, boil, furuncle or carbuncle depending on the location and origin of the lesion. However, other causes should be considered in the differential diagnosis of a superficial lesion with a dermal tract, which include foreign body with surrounding inflammatory changes, ruptured epidermoid cyst and parasitic infestation. An abscess is a localized tissue infection comprised of a collection of pus surrounded by inflamed tissue. Skin abscesses are often polymicrobial from normal regional skin flora as well as organisms from adjacent mucous membranes. S. aureus is present in superficial cutaneous abscesses as the only organism in approximately 25% of cases.1 On ultrasound, abscesses appear as hypoechoic fluid collections with internal debris. There is often a relatively thick capsule with hyperemia. Adjacent inflammatory changes are seen within the surrounding soft tissues. A furuncle, also known as a boil, is an infection involving the hair follicle. These infections are most often caused by S. aureus. They can occur anywhere on hair-covered skin. The infection extends into the subcutaneous tissues through the dermis. The lesion is an inflammatory nodule that forms a pustule through which the hair emerges. When more than one follicle is involved, the infection coalesces, and the lesion is then1termed a carbuncle. Cutaneous infestation by dipterous (2-winged) larvae is known as myiasis. Furunculoid myiasis is caused by the human botfly Dermatobia hominis. Despite the name, this entity does not represent a true furuncle. The human botfly is endemic in tropical regions of Central and South America and Mexico. Other insects which can cause a similar type of lesion as the botfly include the African tumbu fly and the horse botfly. An epidermal inclusion cyst is a slow growing subcutaneous or intradermal lesion. They are most often found in the hair- bearing portions of the body which include the scalp, face, neck, trunk and back. Less than 10% of these lesions occur in the extremities. These cysts are filled with keratin debris, and are frequently asymptomatic. 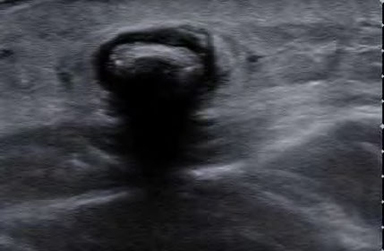 They can become symptomatic when infected or rupture into the surrounding soft tissues.7 On ultrasound, unruptured epidermoid cysts tend to be circumscribed and hypoechoic with small hyperechoic foci centrally. When ruptured, the margins may be lobulated with adjacent vascularity. A superficial subcutaneous abscess is the most common cause of an inflammatory lesion with a drainage tract to the skin’s surface. However, other entities can appear clinically very similar to an abscess and should be included in the differential diagnosis, especially in those lesions that do not demonstrate the expected response to therapy. Furunculoid myiasis is an unusual infestation in the U.S., but should be considered in the differential diagnosis of any non-healing lesion/ insect bite in any patient with history of travel to endemic regions. 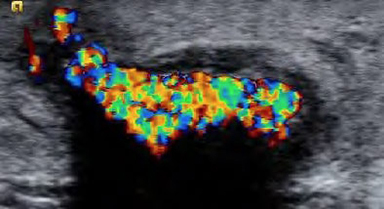 The ultrasound findings of a very echogenic soft tissue foreign body with marked internal signal on color Doppler is highly suggestive of this diagnosis. Stevens DL, Bisno AL, Chambers HF, et al. Practice guidelines for the diagnosis and management of skin and soft-tissue infections. Clin Infect Dis 2005; 41: 1373- 1406. Boyce TD, Fessell DP, Jacobson JA, et al. US of soft- tissue foreign bodies and associated complications with surgical correlation. RadioGraphics 2001; 21: 1251- 1256. 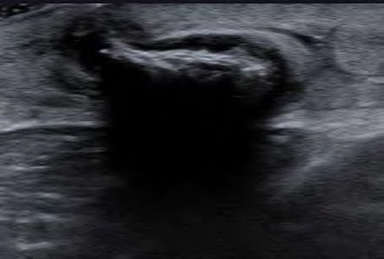 Ahuja AT, Ying M. Sonographic evaluation of cervical lymph nodes. AJR 2005; 184 (5): 1691-1699. Ofordeme KG, Papa L, Brennan DF. Botfly myiasis: a case report. Can J Emergen Med 2007; 9 (5): 380-382. Quintanilla-Cedillo MR, Ceon-Urena H, Contreras-Ruiz J, et al. 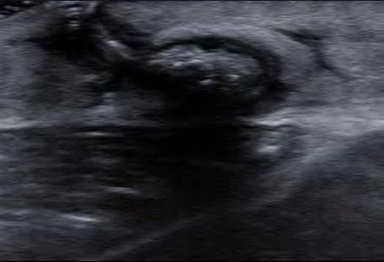 The value of Doppler Ultrasound in diagnosis in 25 cases of furunculoid myiasis. Int J Dermatol 2005; 44: 34-37. Bowry R, Cottingham RL. Use of ultrasound to aid management of late presentation of Dermatobia hominis larva infestation. J Accid Emerg Med 1997; 14: 177-178. Jin W, Ryu KN, Kim GY, et al. Sonographic findings of ruptured epidermal inclusion cysts in superficial soft tissue: Emphasis on shapes, pericystic changes, and pericystic vascularity. Journal of Ultrasound in Medicine 2008; 27: 171-176. Franklin AN. Draining Skin Lesion Following Insect Bite. J Am Osteopath Coll Radiol. 2012;1(3):30-32. Dr. Franklin works with the Department of Radiology, Nationwide Children’s Hospital, Columbus, OH.